Anne Boleyn Files visitor Esther Hyams is a history student and poet who is writing a series of poems about the life of our heroine Anne Boleyn. “Mistress Anne” is the second poem in the series, following on from “Little Nan”. Her charm she loved – a bright Mademoiselle Boullan. 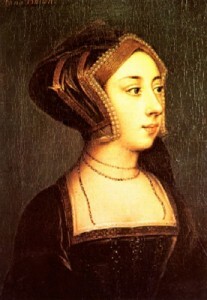 King Henry VIII’s sister, who was cheery and bold. And Anne must grasp another European chance. Bound to travel to France in the autumn of 1514. To England, as Duchess of Suffolk, married to a man she had yearned. But this caused Anne no great upset or distress. Wife to the new King of France, Francois, at a court morally unclean. Without, like other women, being so promiscuous and revealing. Maintaining an honest reputation, her weapon was flirtatious teasing. Her dark, thick, lustrous hair and beauty marks; were so impressive. Her elegance was so provocative, so many eyes drawn to her face. But her black eyes were so exotic, bewitching and bright. She exercised a sexual fascination, but never offered herself to them. She played the lute, sung marvellous music, and danced with such passion. For Henry had no male heir, with Bessie Blount and Mary Boleyn he had been. Standing alongside Mary Tudor, ready to be lured by a knight in this dance. She gazed into the eyes of a knight, so handsome and so bold. A striking man who was so alluring, enthralling and so grand. Read Esther’s third poem “A King’s Passion” – click here.